Ancient Egypt created monumental architectural structures, recorded the first fully developed piece of human literature and continues to provide insights into the higher levels of consciousness and Being. In this blog we look at the Pyramid Complexes as venues for the initiation of living individuals. Old Kingdom Pyramids, built circa 2500 BCE, have long been of interest to the modern Western World. They continue to be commonly purported by many authors to be solely associated with funerary activities in spite of their size, shape and structure being totally different from the many well-known tombs that contain mummies, canopic jars and other funerary objects. Pyramids have none of these and so are easily seen to be different from tombs much like Christian cathedrals and churches can be distinguished from their associated graveyards. Seeing the pyramids as non-funerary opens the question of their true purpose and a full understanding of pyramids is still under continuing exploration by many researchers and authors. Some authors have explored them as power generators. Others see some of them as star charts representing specific periods of time representing either the constellation Orion, Cygnus or both. Here we look beyond the most obvious, massive pyramid structure to examining the full Pyramid Complex that includes other aspects associated with the pyramid proper and how it would have been experienced by an individual during an initiation ceremony. In exploring the pyramids as deliberately constructed venues in support of the development of higher being, it is important to recognize that the great pyramids of Old Kingdom Egypt were not built in isolation from their surroundings. The pyramid was surrounded by a flat area enclosed by a stone wall. The entrance to the pyramid was through a temple. The temple was connected to a riverside temple on the shores of the Nile River. Together they form what we call the Pyramid Complex. Figure 1 shows a modern day satellite image of present day Saqqara in Egypt just southwest of Cairo at the site of the Pyramid Complex of Unas, the last Pharaoh of the fifth Dynasty of the Old Kingdom circa 2400 BCE. This image shows the site layout of the full Pyramid Complex that includes the Valley Temple that can be seen in the lower right-hand corner of the image, the remnants of the connection causeway and the pyramid proper on the left hand side. igure 1. Pharaoh Unas’ pyramid complex with the Valley Temple in the lower right and pyramid in the upper left. The remnants of the connecting, partially enclosed causeway can be seen running through the middle of the figure (Google Earth). So the journey of the individual to the inner sanctum of the pyramid would begin with a boat trip along the all-important Nile River to the Valley Temple. In contrast to the modern day situation where the river has naturally migrated about a kilometer/three quarters of a mile from the Valley Temples, A recent paper by Hale and Collins shows that in the case of the Plateau of Giza, the River Nile historically flowed close to the Great Sphinx and the Valley Temples of the Pyramids of Giza (Figure 2. Similarly for the Saqqara Pyramid Complex in Figure 1, the Nile and the Valley Templer would have provided the disembarkation and entry point for anyone approaching one of the Pyramid Complexes. Figure 2. 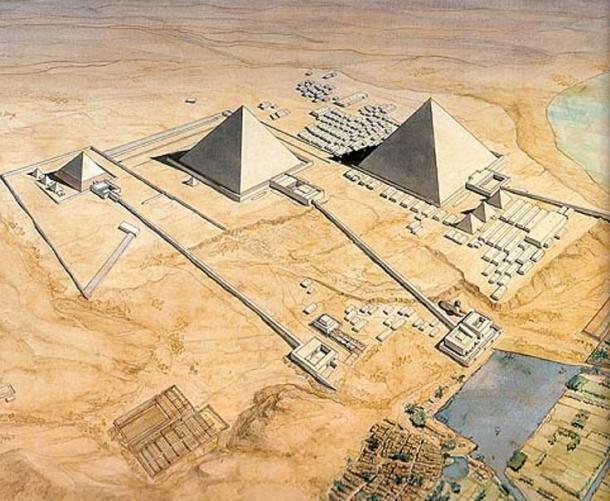 Artist’s reconstruction of the Pyramid Complexes for the three Great Pyramids of Giza Note the Nile marina in the lower right hand corner. From the Valley Temple an enclosed “causeway” ran up the bank and along the ground to the site of the pyramid temple, walled area and the pyramid proper. The causeway was an enclosed structure with its walls decorated with images of daily activities in the life of Egypt and the ceiling covered in painted stars . Of particular note there was an angled slit with a narrow opening to the sky that ran the entire length of the causeway (Figure 3). West102 suggests that the slit was functional in that it would allow a connection with the sky and the stars. The slit would have provided a nighttime star sighting function for initiates making their way up the causeway towards the pyramid. The remnants of a portion of the 750 m (2,460 ft) long causeway in the Unas Pyramid Complex can be seen in Figure 1 as a whitish linear feature that runs more or less horizontally from east on the right hand side of the figure to the west on the left hand. The portion of the causeway at the Valley Temple cannot be seen, as it has been lost to the ravages of time. As with a number of other Pyramid Complexes the Unas causeway does not run in a straight line from the Pyramid to the Valley Temple but incorporates a number of changes of direction. Figure 3. A short reconstruction of the Causeway of the Pyramid Complex of Unas, showing the slit opening in the roof that could have been used for sighting stars on the journey from the Valley Temple up to the Pyramid. The causeway ends at the elevation of the Pyramid in a Temple that abuts the enclosing wall of the Pyramid. This form of temple can be seen in the artist’s recreation for the three Great Pyramids of Giza shown in Figure 2. They can be seen to the lower right hand side of each of the Pyramids. This temple provided the access point into the walled enclosure and the pyramids. Little needs to be said about the pyramid proper of each of the complexes. They are large and eye catching and have received much interest from modern day explorers. From the perspective of an initiate intent on incubation, they form isolated spaces comparable to the often-used caves that continue to be used for meditation by initiates in modern day traditions. Although rough sarcophagi have often been found within the Old Kingdom pyramids there is scant evidence of human remains. Also missing from the pyramids are mummies and all the many other funerary objects typically found in the numerous dedicated tombs of Ancient Egypt. But the suggestion of an initiation ceremony taking place within the isolated confines of the pyramid proper made by Brind Morrow could be the key to their construction. We have been most impressed with the works of Jeremy Naydler & , and more recently Susan Brind Morrow and their findings that the first pyramids, and their carved texts, were designed as special venues for the development of higher Being. The Pyramid Texts are a collection of recitations written in Egyptian hieroglyphs in eleven of the earliest Old Kingdom pyramids built ca. 2400–2300 BCE. The texts are engraved on the walls, ceilings and surfaces of the internal cavities. They are the very first fully coherent literature recorded by humans. They describe the journey of an individual through a world quite different from our ordinary day-to-day world. The Ancient Egyptian name for this “Netherworld” is the Duat. Naydler in his work makes the important point that the Pyramid Texts are intended for readers that are alive. He sees the texts as aids for an initiate who is in the process of reaching for higher levels of Being – that is, someone striving to reaching the level of gods in the stars. “Pepi has gone to be with his ka. Ho, Pepi! You have gone away that you might live; you have not gone away that you might die. You have gone away that you might become akh at the fore of the akhs, take control at the fore of the living, become ba and be ba, become esteemed and be esteemed." How can we envisage the experience of the Pharaoh or initiate. A ritualistic procession of the Pharaonic initiate from the edge of the Nile through the Valley Temple up an enclosed darkened passage built on a man-made causeway to the pyramid may have ended in quiet incubation in the stillness of the inside of their pyramid. Only after passing through these structures would entrance into the pyramid proper and its marvellous Pyramid Texts be accessed. There one would be surrounded by the finely embossed hieroglyphs - thus to be literally surrounded by the Pyramid Texts. It is certain that each of these elements of the Pyramid Complex played an important role in the overall function and use of the pyramids. It is easy to envisage this physical journey of the initiate as embodying a metaphysical journey the soul through the Duat. It is not difficult to imagine the term initiation or “incubation” as applying to what was experienced by the Pharaohs and initiates of Old Kingdom Egypt in the dark stillness inside the Pyramids. We the authors, having personally experienced the stillness of the King’s Chamber in the Great Pyramid of Khufu on visits to Egypt and can testify that it is certainly a place of isolation from the rest of the world and calls us to appreciate that mysteries still exist and can be sensed by us. The Pyramid Complexes formed an important venue for the initiation rites of the Pharaoh. A journey beyond ordinary life, through the Duat, that is the Egyptian netherworld, must have been taken by Pharaohs who were trained for the journey of their spirit through to the high place of the sun, Ra, and back to this world to exist as a star for their people in their lifetime. Pyramid Complexes were likely key to such exposure to their higher Being. Malkowski, E.F. 2010. Ancient Egypt 39,000 BCE The History, Technology, and Philosophy of Civilization X. Inner Traditions. Hale, R., & Collins, A. 2016. A Study of the Simple Geometrical Relationship of the Main Monuments of Giza and a Possible Connection to Stars. Archaeological Discovery, 4, 87-102. http://dx.doi.org/10.4236/ad.2016.42007. West, John Anthony. 1985. The Traveller’s Key to Ancient Egypt: A Guide to the Sacred Places of Ancient Egypt. Quest Books. Brind Morrow, S. 2015. The Dawning Moon of the Mind. Farrar, Straus and Giroux. New York. Naydler, J. 1996. Temple of the Cosmos: The Ancient Egyptian Experience of the Sacred. Inner Traditions. Naydler, J. 2004. Shamanic Wisdom in the Pyramid Texts: The Mystical Tradition of Ancient Egypt. Inner Traditions. Dickie, L.M and P.R. Boudreau. 2015. Awakening Higher Consciousness: Guidance from Ancient Egypt and Sumer. Inner Traditions. Allen, J.P., 2005. The Ancient Egyptian Pyramid Texts. Society of Biblical Literature. page 108. Kingsley, P. 2003. Reality. The Golden Sufi Centre Publishing. Inverness, California.